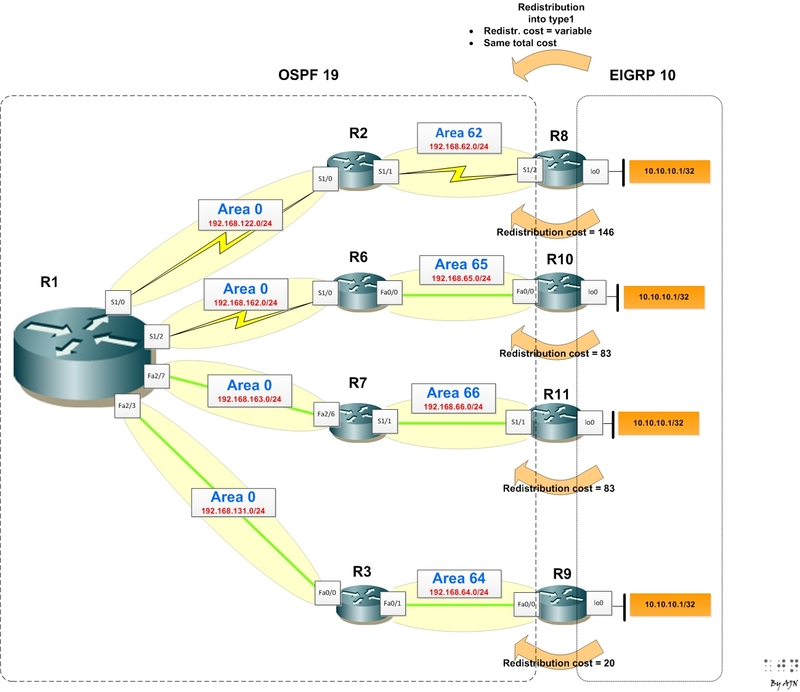 OSPF external E1, E2, N1, N2…Who is the winner? | CCIE, the beginning! ← Administrative Distance, prefix length, metric… Who is the winner? 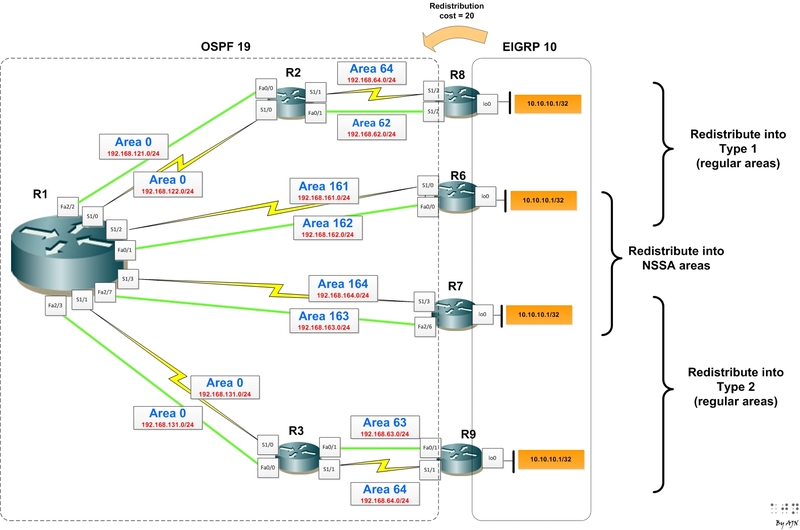 OSPF external E1, E2, N1, N2…Who is the winner? 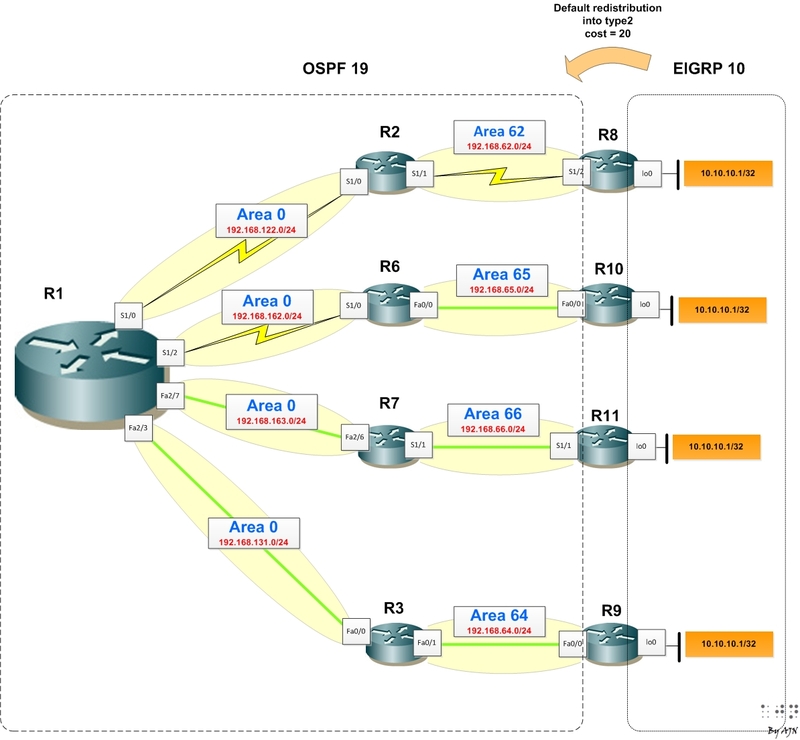 This lab focuses on route selection mechanism of OSPF external routes. The complexity of OSPF selection process is due to its inherent hierarchical structure. The idea is to provide a lab topology in which all types of external routes are artificially available in the same time to the main router (R1). This is done by injecting an overlapping prefix 10.10.10.1/32 through different areas into the same OSPF process. R1(made the DR) is configured not to advertise LSAs and prefixes between its interfaces. Each lab starts with all paths available (case1), then the forwarding interface of the best elected path is shutdown (case2) to see who is the next best route. And so on until the last preferable path. The 2nd lab (All E2): Compare E2 routes with the same redistribution cost, but different costs to ABR and costs to ASBR. The 3rd lab (All E1): Compare E1 routes with the same total cost, but different costs to ABR and costs to ASBR. To keep visible the general structure of the post, verifications commands, configuration listings and the gory details of router configurations are kept in compact flash boxes with selectable text. *** During the automatic testing the link from R1 to R2 (192.168.167) was unstable, so R1 RIB didn’t take it into account. But, theoretically it should be there. Knowing that type 1 cost is equal to the total cost of the route (redistribution cost + cost inside OSPF domain), OSPF does not differentiate between external routes from regular areas and NSSA areas. The one with the lowest total cost wins (N1 and E1 in table1). According to lab1 results, though the cost of type 2 route is equal to the cost of the redistribution, it looks like among routes with the same cost OSPF considers other criteria. Let’s consider a separated lab to compare routes with the same redistribution cost but different combinations of (cost to ABR + cost to ASBR). According to the table, even though E2 cost is equal to the cost of redistribution, among routes with the same cost, OSPF consider the total cost as the tie breaker. For E1 routes, it looks like nothing counts but the total cost. 7 Responses to OSPF external E1, E2, N1, N2…Who is the winner? what will be sequence between E1,E2 and N1,N2? @amit: you are wrong. E2 cost is considered to be much greater than any E1 cost. E2>>E1. The selection preference is N2 with P-bit=1, E2, N2 with P-bit=0. Hi Ilya, I added link to the resources. These are embedded flash apps. It looks like wordpress.com doesn’t support anymore embedded flash code.